The serene atmosphere of the place reflects the relaxing and comforting mood inside our 30 rooms. These rooms were designed with calming earth tone colours, gentle lights and wooden furniture to accentuate the nature and local inspired overall resort theme. All rooms boast a fantastic view of the Ocean and Maricaban Island. Room Size: 15.25 sqm-20.60 sqm. 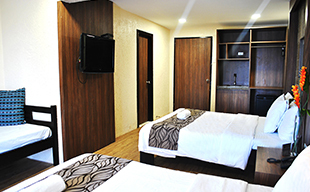 Our cozy and comfy Superior Room offers you an ideal haven for your stay. Selected lower sea view rooms have access to our Function Hall for a quick and easy trip whether your Group is having a seminar or corporate meeting. Our Villa Suite has an open, carefree, and fresh setting designed to relax and ease your busy mind. The magnificent perfect view of the Ocean will surely take your breath away. 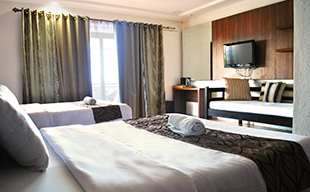 Our Premier Suite Room is ideal for family and friends travelling together for the much needed quality time and bonding. 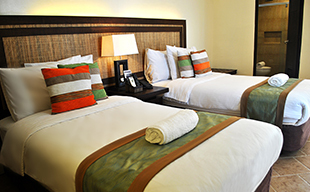 Our spacious room features tasteful nature inspired and local accents to establish a warm and cozy feel. The kids and young at heart will enjoy this room since it has a direct access to the infinity pool.